What’s a net zero energy building? According to the U.S. Department of Energy, schools spend more on electricity and natural gas than on textbooks and computers. Net zero energy schools virtually eliminate that operating expense. And now, because of advances in solar technology, LEDs, other equipment and design techniques, the initial cost of a net zero school need be no higher than that of a conventional energy building. Low energy demand: They operate only nine months of the year and for limited hours. Access is relatively controlled. Occupancy levels are predictable and constant, and after hours only partial. Plug loads are low compared to buildings that run a lot appliances and computer equipment. High renewable energy potential: They’re usually one or two stories— providing a big footprint for photovoltaic panels relative to the square footage inside. Most demand comes during the day, when the sun generates electricity. Owner occupancy: School boards have a longterm interest in reducing utility expenses, and they usually possess bonding authority to fund long-horizon projects. Sustainable mission: Net zero schools provide living labs for growing curricular emphases on technology and the environment. Better learning: A healthier, more comfortable indoor environment stimulates learning, reduces student absences and increases teacher retention. More resilient: In natural disasters, schools with their own power can continue to function and can serve more effectively as community centers. 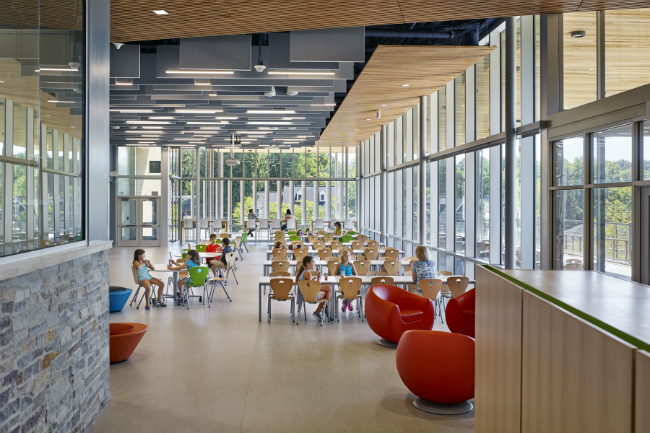 Daylighting reduces lighting costs at Discovery Elementary in Arlington, Va. Photo by Alan Karchmer. The biggest roadblock isn’t technology or cost. It’s a lack of familiarity about net zero among school officials, and the fact that few architects and engineers have net zero projects under their belts. Benchmark. It’s important for school districts to understand the energy efficiency of their existing buildings to get a better idea of how they can get to net zero. If budgeting is an issue, an effective approach may be to design a high-efficiency building with renewable energy but to put off the renewable equipment until later. There are disadvantages, however. Including renewables in the project allows for more flexibility in measuring the cost-effectiveness of various tradeoffs. An integrated design team must be engaged from the start of the design process. In addition to the overall architecture and energy modeling, that team must consider structural issues such as the building envelope, mechanical issues such as the HVAC system, renewable energy capacity, passive solar (including the building’s orientation and massing), energy modeling. If possible, it’s helpful to include a mechanical engineer or architect with experience on net zero or highly efficient buildings. Engage operations and maintenance personnel in a meaningful way during your integrated planning. How the building operates is just as important as the design and construction. Include a management plan for plugged-in devices and controls. Thorough work by a commissioning agent is crucial to ensure that the equipment has been installed properly and is operating from the state. Incorporate sustainability into the school’s curriculum and culture. The occupants are key participants in making the building a success. Engage principal, teachers, parents and students so that they accept this big stain toward sustainability as part of the school’s mission. Net Zero Energy Building certification is available through the International Living Building Institute. ILFI’a certification process makes a network of experts available to the project team, provides independent verification, and serves as platform from which to publicize successful projects. Although they could vary based on building siz, fees for certifying most schools are $4,900. Learn more about ILFI NZEB certification here. The New Buildings Institute keeps database of verified net zero energy buildings, which it refers to as zero net energy (ZNE) buildings. Learn more and to submit information about your building here. 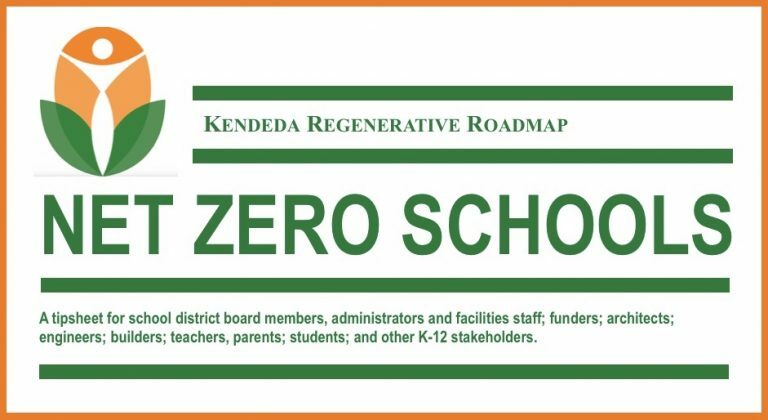 Though somewhat dated, Zero Energy Schools: Beyond Platinum, by architect Paul Hutton in Educational Facility Planner Magazine, is a great overview of solutions actually being employed in net zero schools. The Department of Energy’s Better Building Net Zero Schools Accelerator Center accepts schools as “implementing partners” to receive technical assistance, networking and recognition. 2016 List of ZNE Buildings. Step-by-step guide to net zero retrofits. The Center for Green Schools is a USGBC project that helps schools to adopt a sustainable culture and curriculum. Architecture 2030 developed Zero Tool, a website that helps owners compare their buildings to baselines of similar types of buildings.